Eye tracking can be a valuable tool in understanding how users are interacting with forms and surveys – in order to improve them. It’s a topic I’ve presented on many times, such as in this presentation on Visual Forms to the UK chapter of the User Experience Professional’s Association. 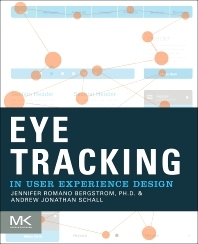 In a new book on Eye Tracking in User Experience Design (Bergstrom, J and Schall, A, eds. 2014, Elsevier) I’ve shared in more detail my experience and recent examples on using eye tracking to understand, design and evaluate user experience. Other chapters in this comprehensive book explore the use of eye tracking in social media, commerce, gaming and low literacy user applications. More on Eye Tracking in User Experience Design on the publisher’s website.